Rosie was the family's robotic housekeeper. Almost six decades later, we're still waiting for a Rosie to come along and rescue us from the burden of household chores (and don't get me started on the flying cars we were promised). So far, the Roomba and the Echo have fallen short of our expectations in that area. But I'm here to report that there's hope on the horizon. All we have to do is to get creative with the devices we already have. Case in point. I have a drone, a little DJI Spark, and it's a lot of fun to fly around the neighborhood, chasing deer and squirrels, exploring the creek while avoiding water moccasins, and spying on the neighbors (well, if we had any neighbors - which we don't - I would totally be spying on them). But it occurred to me this weekend that it was time for this toy to grow up and start adulting like the rest of us, present company excluded. 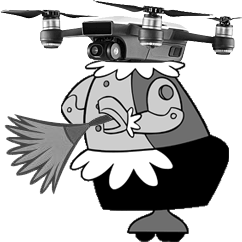 As it turns out, the drone-as-groundskeeper has a few teensy flaws. First, it would take approximately 17 hours to fully clean our outside surfaces. This is a problem because the Spark's battery is good for only about 15 minutes of flying time, and takes ~30 minutes to recharge. Second, weather conditions limit the practicality. You may have been able to perceive that the drone was not hovering steadily in the video. The wind was a bit gusty and definitely impacted the stability of the device. Third, the drone's operating system DID NOT APPRECIATE the close proximity to all kinds of obstacles. Even though I turned off the automatic obstacle avoidance feature, it continued to scream incessantly that I was TOO CLOSE TO EVERYTHING, AT ALL TIMES!!! Once, it even took matters into its own...uh...rotors, and landed itself when I flew it too close to the sidewalk. Perhaps it's intelligent enough to avoid domestic chores better suited for human efforts. This page contains a single entry by Eric published on December 4, 2017 7:31 AM. Pepé Le Pew Deja Vu was the previous entry in this blog. Another day...another skunk. This time, with 100% more me. is the next entry in this blog.